If you know my family, you are aware that my house is often in shambles. We pretty much always have some sort of DIY Home Improvement project going on, and on top of that I am a major clutter bug! In February my husband started one of the biggest projects he has done yet (on our current home). He is building a new, larger laundry room, converting the old laundry and hall closet in to a mud room and building a new master closet for us (see my Laundry & Mud Rooms Pinterest Board HERE). And while he is making steady progress, several areas of our home are torn up, items are displaced and things are generally chaotic. It is a HUGE blessing to have a handy husband because we save tons of money on our projects – but with a full time job and all of our family responsibilities, progress can be slow at times! Anyway…all of that to say: I’m usually really in to decorating for the holidays and switching things out by season, but as the “Baby It’s Cold Outside” picture beside my front door indicates, I haven’t been spending much time on the rest of the house lately. I didn’t even get out my Easter decorations this year, which my kids didn’t notice thankfully! 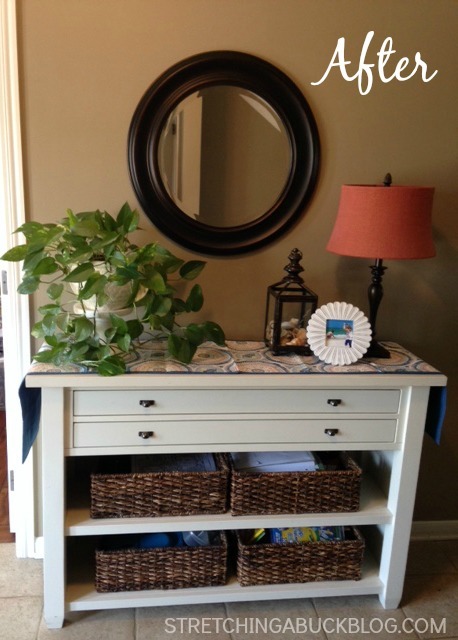 This week I decided that it is time to switch a few things up – especially in my foyer, kitchen and powder room. We have a mostly neutral palette in this house and it’s feeling kind of blah. I have been loving all of the blues and corals in stores lately (especially at Pottery Barn and Target), and with neutral walls I am able to switch my accessories out fairly easily. 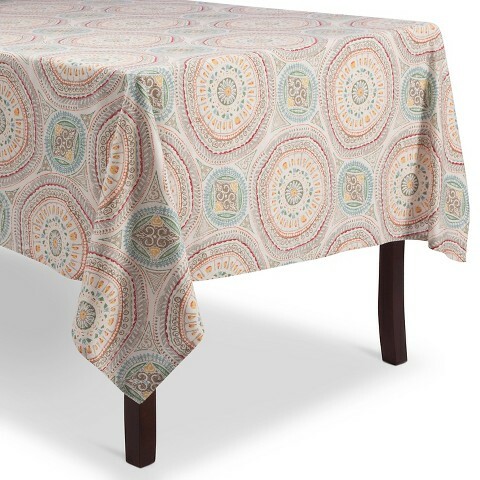 I’m actually going to use the table cloth as fabric for some other projects that I have in mind, and at $16.99 I figured it was cheaper to buy this to use as fabric than to buy actual fabric. More on those projects later! I replaced the green (also from Target) table runner with the new runner, replaced the picture frames with a plant that I grabbed from my dining room (it is sitting on a white candle pillar holder, also from Target to give it some height). I kept the same lamp (purchased at a local shop) but I switched out the neutral shade with a red Pottery Barn Burlap shade that I had been using in our guest room. The white picture frame is also a Target find from a few years ago, and is holds one of my favorite pictures of my girls at the beach last summer. I also decided to put the seashells that they found to good use by placing them in the Pottery Barn Lantern that I purchased at the Pottery Barn outlet 3 or 4 years ago. I have fun switching out the contents of that lantern with the seasons. 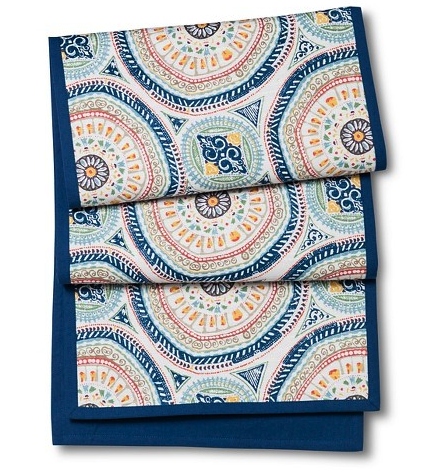 My overall cost for this Spring/Summer Foyer Table Refresh was the cost of my pretty new table runner – $17.99. I love having neutral, versatile accessories on hand that I can switch out and re-purpose when I get bored with my decor. Shopping my home for my decorating projects saves me a lot of money! I am definitely a novice decorator in the sense that I don’t really know what the heck I am doing. I am super thankful for Pinterest and Target and TV shows like Fixer Upper (my fave) for ideas, otherwise I would be completely lost. In the end, as long as your decor makes you happy, it doesn’t really matter if you are following the “rules” or creating something perfect. At least that’s what I tell myself! Now that I have my foyer table refreshed for spring and summer, I’m hoping to keep the momentum going in my kitchen and powder room. 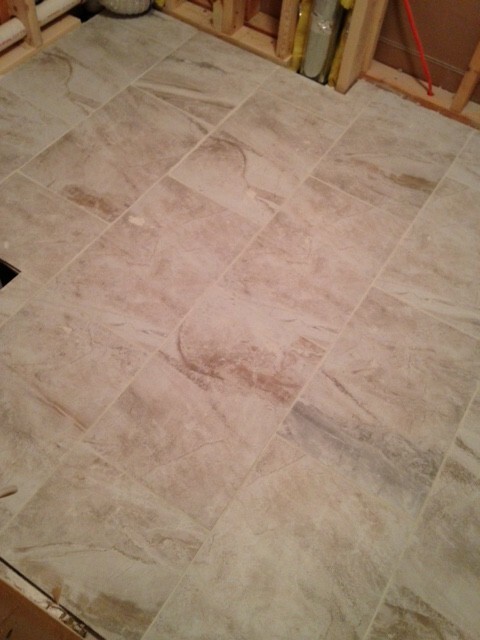 Not to mention we are working to finish up the laundry room. Stay tuned for more on those projects! 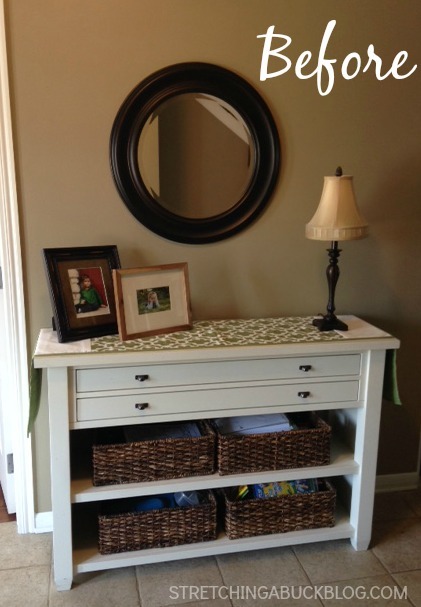 What DIY projects are on your list to tackle? I’m hoping to share more of our escapades in the upcoming year! Follow along with our projects here. You can also find me on Pinterest here.